Much of the reporting that has come out of Syria in recent months has been done by freelance journalists and citizen journalists. The death of Canadian freelance photographer Ali Mustafa while documenting the Syrian civil war illustrates the persistent problem of the safety of journalists in the country and, increasingly, the particular threats faced by freelance journalists reporting in one of the most dangerous locations on the planet. Much of the reporting that has come out of Syria in recent months has been done by freelance journalists and citizen journalists. 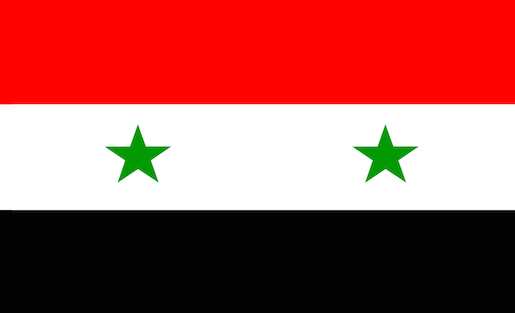 The only major news networks operating within the country are outlets like Syrian Arab News Agency (SANA) that have long been arms of the Syrian government, carrying a very strict party line and presenting news entirely from the perspective of the Assad government. "Freelancers are often more vulnerable to the surrounding violence in conflict-stricken areas, and have limited access to resources such as protective clothing or training on how to report safely within a war zone." For much of the Assad family’s reign, media has been tightly controlled by the government. With the death of Hafez al-Assad, father to current Syrian President Bashar al-Assad, in 2000, a strong demand for reform paved the way for tentative relaxation of some of the stricter information controls on the Syrian people. Though there were slight improvements, even some open discussions of opposition politics, these reforms were quickly undone, diminishing any chance there might have been for the growth of an independent media within the country. As the Internet became more advanced, the Assad regime initially kept tight restrictions on free expression in the digital sphere. However, there was a move in the beginning of 2011 to allow access to Facebook and YouTube in the country. Although it’s been speculated that the government goal was to monitor the activities of public opposition groups, the opposite became true. Social media gave activists the tools to organize and provided platforms for citizen journalists to share their stories with other Syrians and the rest of the world. In early 2011, as the Arab Spring bloomed in Syria, these new citizen journalists created a wellspring of independent media, and the international spotlight on the burgeoning political turmoil led to a dramatic increase in the number of foreign journalists entering the country. However, very soon after, many foreign journalists were expelled from the country as peaceful protests were violently put down by the government. Since then, it has largely fallen onto the shoulders of journalists secretly entering the country to brave the dangers of the now-violent Syrian revolution, or else tour the country closely monitored by a Syrian government representative intent on controlling the flow of information about the civil war. 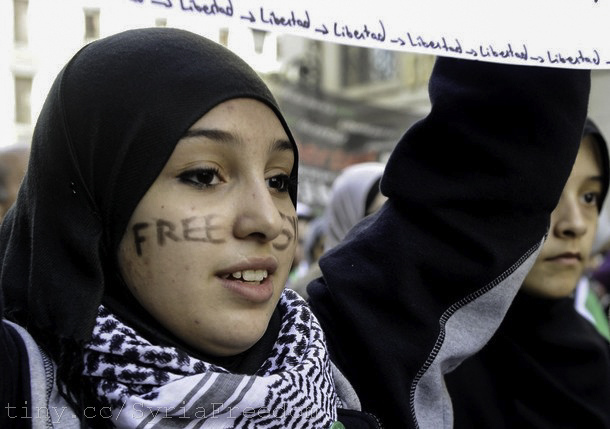 A young woman with the words “Free Syria” written on her face attends a demonstration against violence in Syria on February 26, 2012 in Madrid. Photo by Freedom House on Flickr and used here with Creative Commons license. Since the revolution began, Syria has become the most dangerous country in the world for journalists. In its 2013 annual report, the Committee to Protect Journalists counted at least 29 journalists killed while working in Syria, bringing the total up to 63 since the violence began in late 2011. A few of these deaths, like those of journalists Marie Colvin and Remi Ochlik, killed in Homs in 2012, are suspected to have been deliberately targeted by the government. In addition to deaths, kidnapping has been used as a method of silencing journalists, with over 60 cases reported in 2013 alone. Whereas the deaths of journalists could, in some instances, be considered unavoidable due to the danger of reporting in a war zone, these kidnappings are clearly targeted operations. Many of the kidnappings are perpetrated by rebel groups, particularly the Islamic State in Iraq and the Levant (ISIS). An Islamist schism distinct from the non-theocratic rebels, ISIS has been condemned by Reporters Without Borders, among other free expression organizations, for its hostility towards journalists working in Syria. This climate is making many journalists think twice about reporting from the conflict. With most major news agencies pulling their staff journalists out of Syria, the burden is increasingly falling on freelance and citizen journalists, though it may now be too dangerous for freelancers to work in the country. Freelancers are often more vulnerable to the surrounding violence in conflict-stricken areas, and have limited access to resources such as protective clothing or training on how to report safely within a war zone. With the Assad regime and extremist rebel factions showing complete disregard for the safety of journalists, the only alternative to help many of these daring freelancers is to urge news agencies purchasing their work to offer them a greater degree of protection. Writing for the New York Times, James Estrin and Karam Shoumali describe the protective mechanisms given to a network of Syrian citizens turned freelancers who work for news wire services like Reuters and operate in incredibly dangerous locations. Photographers, for example, are given camera gear, a flak jacket and a helmet. Although the pay of $150 per day provides some financial security for them, none of the photographers are offered any medical, safety, or ethics training— valuable tools when reporting in the midst of a civil war. Ethical training is particularly important in conflict zones, where journalists need to be diligent about performing risk assessments and determining when and how to extricate themselves from an escalating situation. While these freelance photographers often produce stunning results, concerns about staged photos and the use of pseudonyms have called into question the objectivity of photos submitted by local freelancers. Since many of these photographers are also activists for the rebels, it seems impossible to prevent any hint of bias from filtering into their reporting on the conflict, particularly when they and their families are so inextricably involved. Though that last fact does not disqualify their credibility, it does lead to concerns of veracity. 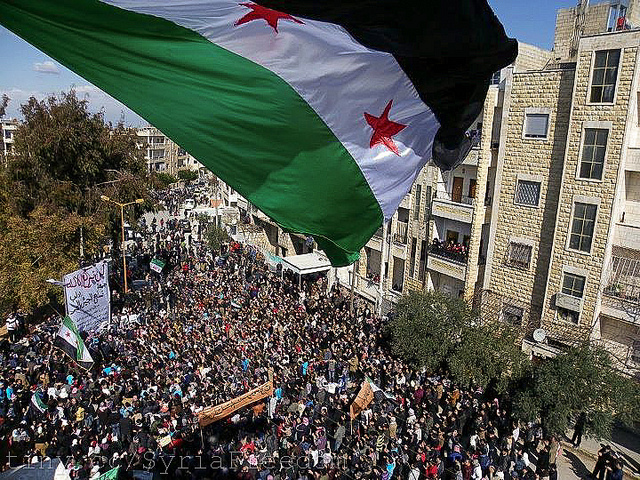 The Syria independence flag flies over a large pathering of protesters in Idlib. Photo by Freedom House on Flickr and used here with Creative Commons license. This portrait of struggling freelancers highlights how news agencies must provide greater resources to freelancers risking their lives to report in areas so dangerous that no staff reporter would be sent in their place. The response from some news agencies such as The Guardian has been to avoid buying work from freelancers entirely so as not to “encourage freelancers to take exceptional risks.” Though this may prevent others from taking the risk of traveling to and reporting from Syria, it does little for local journalists hoping to make a living by documenting the conflict. Reporting from a war zone is never an easy or safe task, and the warring sides likely won’t break for a stalemate while journalists document the carnage. However, the targeting of journalists with violence prevents the rest of the world from understanding the complexities of a conflict that has so far claimed the lives of over 150,000 people, displaced more than 9 million and produced a human rights crisis of epic proportions. In a situation like Syria, where the absence of accurate information can produce dire consequences in terms of formulating a measured international response, the safety of journalists is paramount. José Gonzalez is a freelance journalist currently working in Toronto, Ontario. This article was originally published on CJFE.org, the website of Canadian Journalists for Free Expression, a member of the IFEX network. The IFEX network of organizations is connected by a shared commitment to defend and promote freedom of expression as a fundamental human right. Check out IFEX’s website or follow them on Twitter, Facebook or YouTube. An insightful article, this is a side of freelancing that not many people see, given that there are so many options and fields with freelancing, with many people working from home with their freelancing career. Freelancers in this field should definitely get more compensation for risking their lives.